Russian President Vladimir Putin has insisted gay and lesbian athletes have nothing to fear at next year's Winter Olympics in Sochi, Russia. Mr Putin told Thomas Bach, the head of the International Olympic Committee, that gay athletes - and supporters - would feel at ease. 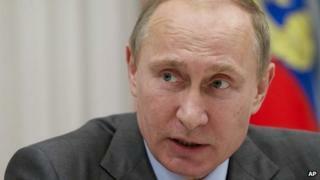 Russia has been criticised over a new law banning "homosexual propaganda" towards people under 18. But a proposed boycott of the Games has gained little momentum. There was some suggestion that gay visitors might face prosecution in Russia, but Moscow says this will not happen. "We will do everything to make sure that athletes, fans and guests feel comfortable at the Olympic Games regardless of their ethnicity, race or sexual orientation. I would like to underline that," Mr Putin told Mr Bach. But gay rights groups have accused the IOC of not putting enough pressure on Russia, which has invested more in its Games than any previous Olympic host. During his visit, Mr Bach made no public mention of the new law, focusing instead on Russia's preparations for the Olympics. "We are fully confident that the Games will be on a magnificent level," he was quoted as saying by the Reuters news agency. Asked about concerns that there might not be enough snow to host events in the Krasnaya Polyana mountains, near Sochi, Russian Deputy Prime Minister Dmitry Kozak, said organisers have stored 700,000 cu. m (24.7m cu. ft) of snow as a contingency. Under the homosexual propaganda law, passed earlier this year, private individuals promoting "non-traditional sexual relations" to minors face fines of up to 5,000 roubles (£100; $155) while officials risk paying 10 times that amount. Businesses and schools could be fined up to 500,000 roubles. Activists in the West have been outraged at the measures, calling on athletes and countries to boycott the Games. Gay bars in New York, London and elsewhere have boycotted Russian vodka. But for many in Russia, where homosexuality was decriminalised in 1993, the law is much less controversial. A recent poll found that nearly half of Russians believe that the gay and lesbian community should not enjoy the same rights as other citizens. In August, Russian pole vaulter Yelena Isinbayeva, spoke out in favour of the law at the World Championships in Moscow, but later said her comments concerning homosexuality had been "misunderstood".